One alternative to getting a job is to create your own! There are certain areas of the recycling industry that lend themselves to entrepreneurial activity. This article reviews some of these options as they pertain to collecting scrap, pallets, and rubbish, as well as franchise opportunities. The scrapper or scrap collector is an individual who finds recyclable or reusable material and then typically sells it to a larger recycling business. Scrap collectors traditionally have focused on scrap metal. Nowadays, there are also scrap entrepreneurs who specialize in wood pallets, plastic or corrugated cardboard and junk collection. Scrap Metal Collector: One common form of scrap self-employment is that of the scrap metal collector. 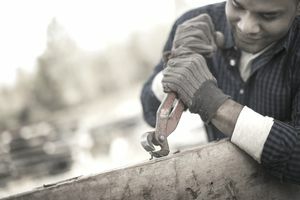 This type of self-employment typically requires the operator to have a pickup truck or industrial trailer for picking up unwanted scrap metal from small businesses or residential locations. Other equipment required often includes straps or nets to secure cargo, cutters, magnet, grinding wheel, gloves, buckets for sorting smaller items, and perhaps a winch for larger items. Before launching a business, the scrapper must become aware of relative material values for ferrous and nonferrous metals, for example, as well as locations of metal recyclers which will buy material. In regard to marketing efforts required, the scrapper typically communicates the availability of scrap removal services. The scrap collector may or may not be paid by property owners to remove scrap, and then subsequently seeks revenue through the sale of material to larger recyclers. Scrappers will generate more income by effectively sorting material of different value. Industry insiders caution that mix metal scrao will default to the material having the lowest value. Wood Pallet Collector: The wood pallet collector is sometimes referred to as a pallet picker or pallet street vendor. This operator gathers unwanted empty pallets that are unwanted by businesses. Typically the pallet collector will have a small truck or trailer to stack the pallets upon. Once secured, the pallets are often delivered to a larger pallet recycling business, and the collector will be paid for the pallets collected. As in other forms of scrap collection, pallets do not all have the same value, and payment will depend on the types of pallets collected, as well as their condition. Pallet collectors can generate additional income in some cases by performing light repairs to pallets themselves, or by selling directly to an end user of pallets rather than a pallet recycling operation. A junk removal operator is someone who removes unwanted items or material from residential or business locations for recycling or disposal. Typically the junk removal provider is paid by the client for hauling away material, including and additional disposal fees that must be paid to drop off material. Starting a junk removal business can be as simple as having a pickup and posting on Craigslist for jobs, but to be as successful as possible, it is important to treat your junk removal service as a professionally run business. As with other types of services involving the pickup of junk or scrap material, it is prudent to first perform market research, including competitor pricing and services, dump or recycling charges, estimation of pricing and profit margins, applicable local, state and federal regulations, and seasonal volume considerations. During the winter, junk removal can slow down considerably. Another way to create your own job in the recycling and reuse sector is through the purchase of a recycling or reuse franchise, although such an approach will require a level of investment of several thousand dollars, depending upon the opportunity. These are available in a number of different areas, including junk removal, paper shredding, pet waste removal, and reusable container rental for moving. Becoming an entrepreneur is one way to gain employment in the recycling sector, but there are several things to consider in a new business venture. There is an element of risk in terms of investment requirements and generating revenue, but the rewards and satisfaction can make it a worthwhile experience!